GotoMeeting runs on the Mac! I love GotoMeeting, but until now I had to run it under Windows. You could only run it as a viewer under OSX before, but the latest version has a full function Mac client. 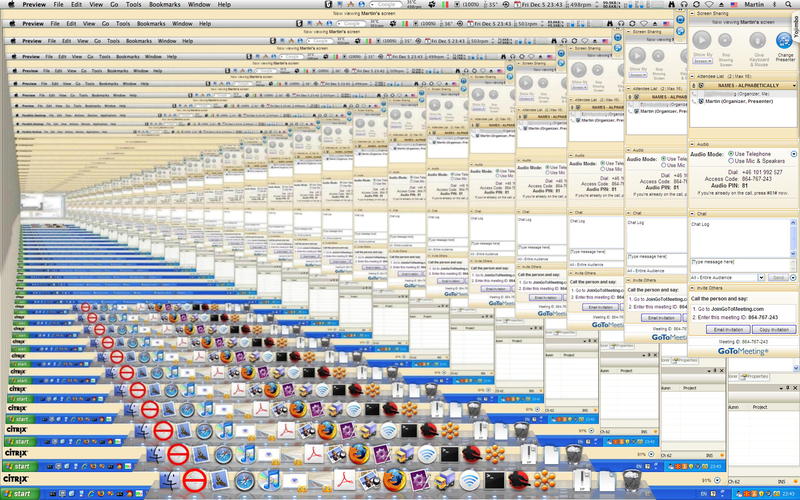 I opened GotoMeeting under OSX (Firefox) then under XP (Firefox) on the same machine in a full screen virtual window, and I got this beautiful effect as the image was recursively drawn out into the distance. Looks a bit like a very deep cinema with the rows populated by Mac icons up front and in the back. Click for a larger image.